Imagine standing on a cliff that hangs over the ocean. And imagine that the sun is shining brightly and the ocean waves are sparkling. Imagine that the cliff you are standing on is not the only cliff; many more line the ocean horizon. This is a beautiful, quiet day, probably around two in the afternoon. Maybe you are having a picnic on the cliff. In short, you are enjoying yourself immensely. But suddenly, a loud cry, almost a scream, breaks the silence. You hear a sharp whistling, as if a plane is hurtling downwards. You see, far off in the distance, a black speck coming down towards you. As it gets closer, you realize that it is an animal, and there’s a person sitting on its back. And just before it hits you, huge black wings flare out. You see a flash of teeth, and certain death is avoided. You might have had this very experience had you been living in DreamWorks Animation’s Berk, the fictional land in which How to Train Your Dragon is set. This is the latest in DreamWorks animated film repertoire, following the likes of Shrek, Kung Fu Panda, and Monsters vs. Aliens. In How to Train Your Dragon, actor Jay Baruchel plays the role of Hiccup Horrendous Haddock III, the son of the viking lord Stoick the Vast, voiced by Gerard Butler. Stoick, like any good parent, wants his son to succeed at what vikings do best: killing dragons. But the scrawny Hiccup has other plans. Instead of killing and fighting dragons with his bare hands like his father, Hiccup prefers to build contraptions in order to capture the dragons. His aim is to capture the elusive Night Fury, a dragon that no one has ever seen, but always wreaks havoc upon the viking village. However, Hiccup’s inventions often go wrong, hurting rather than helping. But by the time we see the story, Hiccup has perfected his invention, a crossbow/catapult weapon. He still causes damage, but this time, he’s sure he caught the beast. And the audience is led to think so too. As the viking warriors set out to find the nest of the dragons and destroy them once and for all, the viking children sat at home, to be taught dragon-fighting by Gobber the Belch, voiced magnificently by CBS’s Craig Ferguson. How to Train Your Dragon has the potential to be yet another “follow your heart” film, made popular by 2000s-era Disney. A rebellious son knows more than his parent, and ends up being the better character as the father must apologize to his kid. But this movie takes a different track. Sure, Hiccup is not doing what his father wants (and there’s a penalty for that later, but that’s a SPOILER). But instead of Stoick falling to his knees in front of his son, both make amends. It’s refreshing to see good morals pushed in an animated films. For far too long, those types of films have been the threshold for rebellious kids and dumb parents who just don’t understand. However, DreamWorks is by no means the pioneer of such storytelling. Pixar holds that title. In any review of an animated film, it’s hard to not compare the film with one of Pixar’s amazing efforts. DreamWorks has long been Pixar’s lesser rival, and in recent years, has been churning out some grand movies. Kung Fu Panda was epic. However, I believe it suffered from being released in the same year as Wall-E, a virtuoso piece of filmmaking. The more recent Monsters vs. Aliens does not even compare to the emotion-filled Up, either. It remains to be seen how How to Train Your Dragon will measure up to Toy Story 3. But in my opinion, at least, I think How to Train Your Dragon is a better movie than a couple of Pixar’s. But this is a review of Dragon, so I best bring it back to that film. The plot, based on a series of children’s books, is well-written, as are the characters. Are they a bit stereotypical? Of course they are. Two of them are twins, named Tuffnut and Ruffnut, and, you guessed it, they fight a lot. One is named Snotlout, a chunky fellow who is brave but stupid. Yeah, they’re stereotyped, but it’s OK, because this is a comical animated movie about training dragons. They should be stereotyped. They represent all sorts of people, just trying to live. One more observation before I finish this review. This is an epic movie. This is Lord of the Rings epic. Many scenes look like they were filmed in New Zealand, where Lord of the Rings was filmed. This has become DreamWorks’ specialty, taking fairly mediocre stories and turning them into epics. Instead of crashing badly into the ocean waves, the dragon pulls up at the last moment, which is not too unlike this movie. I was afraid the movie would fall into cliche territory. But instead, it throws a number of curveballs, becoming quite a good movie. Hello readers!! I’ve decided to use this blog as a place to review films and my other blog, thefunvee.tumblr.com, as a place to share my discoveries and/or new ideas I have. We’ll see how maintaining two blogs goes. Up first (because this is the last week of classes and next week is finals, it won’t be up for probably a week and a half) will be a review of Blade Runner, my all-time favorite default film. Looking forward to working on this. Just to let everyone know, I’m going to be writing four reviews in the upcoming future. I’ll review four movies that, to me, form a loose quadrilogy that spans the time periods from Ancient Rome to modern era. Each of these movies features a big name actor in a hero type role. It’ll be fun for me to write the reviews and hopefully fun for you to read them. Here’s part of an interesting email I received today. Lots of food for thought, especially for anti-gun people. You won’t see this datum on the US evening news, or hear politicians disseminating this information. 8. Beware the man who only has one gun. He probably knows how to use it. As I’ve said before, I’m a movie buff and I love reading. If you love movies and books, you’re also going to have some favorite characters. These are my all-time favorites. The Joker Why do I love this guy? I’m simply obsessed with him. It’s probably his devil-may-care attitude. Nothing fazes him. There’s one Batman comic in which he and the Scarecrow team up to rob a bank. After they succeed in robbing the bank, Scarecrow turns his fear toxin and unleashes it on Joker. The toxin does nothing, however, and the Joker proceeds to bash Scarecrow over the head with a chair. I simply love the Joker’s method-in-the-madness way of doing things. Indiana Jones This one is easy. Indiana Jones is a character that just about everyone can identify with, as opposed to James Bond, who has the expensive gadgets and expensive cars. Indy is the kind of guy that messes up, but always finds a way to get out of it. And who doesn’t want to risk their lives for priceless treasure? Captain Nemo This is a tragic character, of sorts. Bordering on insane, Captain Nemo rules the seas in his submarine, the Nautilus. The terror of all surface boats, Captain Nemo left land after losing his family and suffering the injustices of mankind. He’s a character we all pity, yet oppose. I’m sure that by now, most people in Kentucky know how the Kentucky Derby ended. Big Brown won the race, with filly Eight Belles making a glorious second. However. Eight Belles broke both front ankles and had to be euthanized. It’s a very sad ending. However, pestering animal rights group PETA won’t let it rest. This article tells it all. The poor jockey that rode Eight Belles is under PETA suspicion. This poor guy probably considers it his fault that Eight Belles died. The matter under questioning is the fact that the jockey applied the whip at the last minute. The trainer of the horse however (who is the best authority on the subject at hand, by the way) justifies the jockey’s actions by saying that Eight Belles had a habit of riding near to the rail. The jockey simply applied the whip to keep her from crashing into the side. No sane person would apply the whip to try to make the horse go faster! Big Brown won the race by a landslide! There is no horse that was going to catch up to him in that time. And Eight Belles obviously had second place. There was no reason whatsoever for the jockey to try to get the horse to go faster. But PETA, idiots that they are, want the jockey suspended. PETA has no concern for their fellow human beings. Their campaign for animals is blatantly anti-human. PETA is nothing more than a massive bullying group. Here’s another article that “illustrates the brutal side of horse-racing.” There is no brutal side to horse racing. You want to know what would really be brutal? Keeping racehorses from racing. They’re bred to do this! Any racehorse would fall into depression if they were kept from racing. Hurray! Gandalf’s back! I’m sure by now you know that The Hobbit will be made into a movie. Peter Jackson will be somewhat attached to the project, but he won’t be directing. However, Jackson handpicked Guillermo del Toro to take the reins. Here’s the odd thing though: they will be making two movies. The first one will be the actual story of The Hobbit, and the second one will fill in the time between The Hobbit and The Lord of the Rings. This I am opposed to. I’m excitedly waiting for The Hobbit, but I see no reason whatsoever for a movie that fills in the blanks between the books. It probably wil be rooted in some of Tolkien’s appendix work, but still: there’s no need for it. But we’ll see; maybe it will be enjoyable. But to get on to the real topic of this post. 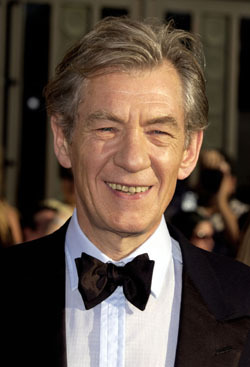 Sir Ian McKellen, who played Gandalf in the three Lord of the Rings movies, will be reprising his role as the lovable wizard. It will be interesting to see him only in the Gandalf the Grey character, as he was Gandalf the White for two-thirds of the Lord of the Rings movies. Not to mention that Lord of the Rings movie marathons will take longer than they do now with the added movies! It’ll be neat to watch The Hobbit and then the Lord of the Rings. Production slated to start in 2009, with the release of the first movie in 2010 and the second in 2011.